When you want to synchronize your files, Easy2Sync should be your first choice. And the new releases files some final details for Vista compatibility to make everything run smoothly. For this problem ReplyButler has a great feature: The “Context” menu! It’s great, have a try. Want to try? Get the demo here. Easy2Sync for Outlook has a neat user interface which is just great for most of us. But sometimes, you want to use batches or links. And for these occasion you can also run the sync from command line with parameters. Yes, another version is out (1.28). So, it’s even better now and we have a free version: Why not download it for your Outlook? Easy2Sync for Outlook 1.23 is out! Another day, another release. Version 1.22 didn’t last very long because we had the wrong language in the assistant. That’s fixed now, our apologies for any inconvenience caused. 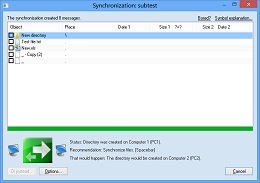 Do you want to try Easy2Sync for Outlook? You can download the Freeware Edition here. Posted in New Release, Outlook, Sync | Comments Off on Easy2Sync for Outlook 1.23 is out! It pays off to record your typical phrases in e-mails and store these canned texts to reuse them later (like in a macro key recorder). And there’s a trick in ReplyButler to make this very easy. And that’s it. Our keyboard tool “ReplyButler” will create a ClipText for you and ask for the folder to store it in.